Check boxes are independent of each other. Although they’re often found in groups, any check box can be checked or unchecked regardless of the status of its neighbors. Each check box is an individual input element. Note that check box values aren’t displayed. Instead, a label (or similar text) is usually placed after the check box. 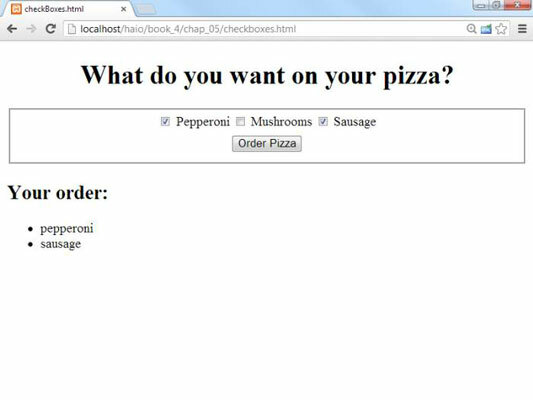 A button calls an order() function. Note the labels have a for attribute which connects each label to the corresponding check box. When you connect a label to a check box in this way, the user can activate the check box by clicking on the box or the label. This provides a larger target for the user, making their life easier. Happy users make fewer mistakes, which makes your life easier. You can use the value property to store a value associated with the check box. The checked property is a Boolean value, indicating whether the check box is checked or not. var result = "<ul> n"
Determine whether the check box is checked. Use the checked property as a condition. If so, return the value property associated with the check box. Often, in practice, the value property is left out. The important thing is whether the check box is checked. If chkMushroom is checked, the user obviously wants mushrooms, so you may not need to explicitly store that data in the check box itself.